For use indoors and outdoors. May be placed in homes, or industrial and agricultural buildings. Ideal for capturing the occasional “intruder” or as part of a more extensive control program. 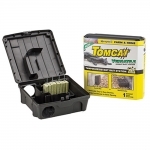 A refillable mouse bait station that includes 1 oz Tomcat Chunx bait refills. 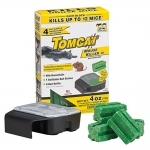 2 pack pre-loaded, single use, disposable mouse bait station that includes Tomcat bait. 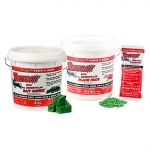 Includes 4, 1 oz Tomcat with Bromethalin Chunx bait refills. 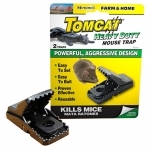 Multiple-feeding bait kills rodents in just 4-6 days and can be used indoors or outdoors. 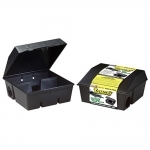 Holds bait securely in the station, away from livestock, pets, children and non-target animals. 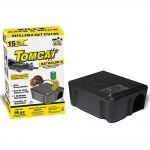 Pre-loaded, single use, disposable rodent bait station that includes 4 oz Tomcat bait. 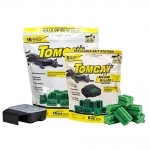 Includes 15, 30 gm Tomcat with Bromethalin Chunx bait refills. 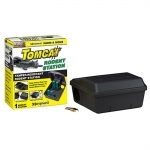 Holds bait and traps securely in the station, away from livestock, pets, children and non-target animals. Fully enclosed capture area kills mouse and helps keep you from being exposed. Can be positioned vertically or horizontally to fit any baiting or trapping situation. 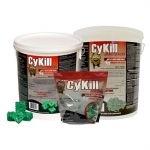 Delivers a proven blend of palatability, effectiveness and speed of kill.